Did you know fire boats, first created in the 18th century, are still around and getting use? While those of us burning on land might be eyeing a type 2 brush truck, California firefighters prefer to have a floating vessel to aid their efforts. Read on to check out a little more info about this 18,000 gpm-pumping monster. The San Francisco Fire Department hasn’t had a new fireboat in more than 60 years — until now. The city officially christened its new 88’x25′ fireboat, the Fireboat 3, in mid-October. The boat has an 18,000-gallon-per-minute pumping capacity. (The boat’s name may change, but it was still Fireboat 3 as WorkBoat went to press.) The city has two other fireboats — the Guardian, built in 1951, and the circa-1955 Phoenix. The two boats will stay on the job. 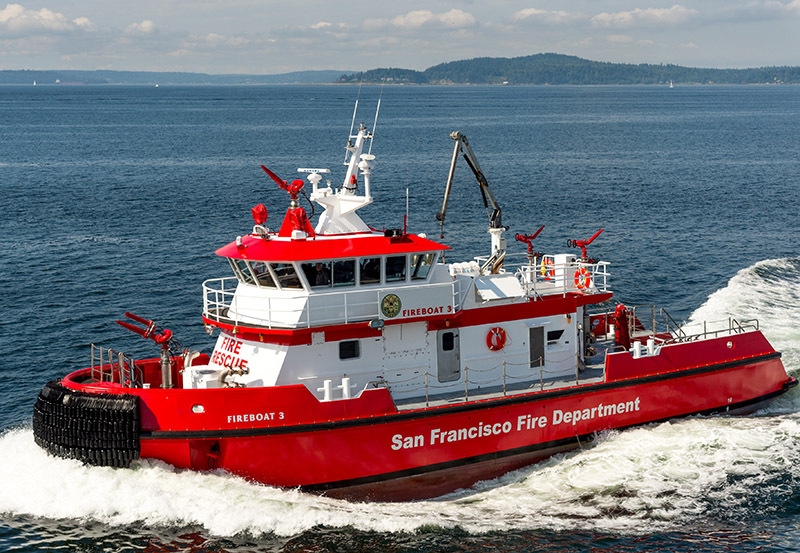 Designed by Jensen Maritime Consultants and built at Vigor’s Seattle shipyard, the $11.8 million, steel-hulled Fireboat 3 is considered a first-in-class vessel. That was solved with funding from three different entities — $8 million from a federal port security grant, $3.3 million from the city of San Francisco, and $450,000 from a federal UASI (Urban Areas Security Initiative) grant. While Fireboat 3 will act as any other fireboat in the port of San Francisco, its main function will be as a mobile pumping station for city water, with the ability to plug into the city’s water system should a major earthquake cause a disruption of the system. Three Cummins QSK19-M, Tier 3 diesel engines, producing 750 hp at 1,800 rpm each, provide propulsion and pumping power. The Fireboat 3 engine room, where the Cummins main engines take care of propulsion and pumping power. Vigor photo. When it comes to pumping, the mains power three Counterfire ESF 300-550 pumps with a capacity of 6,000 gpm each. That’s a total of 18,000 gpm at 150 psi (all three pumps in parallel) or 6,000 gpm at 300 psi (two pumps in series) that flows through six Stang monitors. Power is transmitted to the pumps through three Logan LC318 SAE #0 air actuated clutches and Elbe cardan shafts with Centa Centaflex-R flywheel-mounted torsional coupling. The engines are mounted on Christie & Grey TSC T-10 vibration isolators. For propulsion from the front of the engine, the two outboard Cummins engines also provide 591 hp at 1,800 rpm. The engines turn 62″.55″, 4-bladed, CF-3 Sound stainless steel propellers through Centa CX-56 torsional couplings and Karl Senner-supplied Reintjes WAF 364 reduction gears with 4.92:1 reduction ratios. For added maneuverability, the new fireboat has a Wesmar V2-2ONS bowthruster. The new San Francisco fireboat has a running speed of 11.5 knots. The new fireboat’s main job is to keep the city’s water system flowing in case of a disruption. The boat can pump 18,000 gpm into the system at various locations. Vigor photo. “It’s really unique. It’s a huge floating pumper,” said Sperling. “The fire department was more concerned with the boat being a provider of water” for city services following an emergency. A Northern Lights M99C13 genset provides ship’s electrical power, an Aventics Marex OSIII system handles control needs, and a Jastram S-17-2-45 steering system that ensures the boat goes where it is supposed to go. Fireboat 3’s capacities include 10,900 gals. of fuel; 250 gals. water; 100 gals. lube oil and 1,046 gals. foam concentrate. The electronics suite includes a variety of Furuno equipment, Nobeltec navigation software, Simrad autopilot and FLIR thermal camera. Though the boat is not officially classed, “the boat is built to class,” said Sperling. It’s rare when a first-of-a-kind boat is delivered on time with no delays. It didn’t happen with Fireboat 3 either. Originally due out in early 2016, the boat was delivered in July. At one point the job’s electrical subcontractor went bankrupt, according to the San Francisco Examiner. Because the owner, designer, builder and all those associated with the new boat had to approach it as a first of a kind, working closely together wasn’t just lip service. It was a necessity. SFFD’s Lombardi said there was a paradox in putting together a state-of-the-art, modern fireboat that wouldn’t be too complex to operate and have minimal maintenance responsibilities. In the end, owner, operator and builder got what each was looking for. What’s most important is how the customer feels about the project once it’s completed. “It worked out well for the fire department,” said Lombardi. Fireboat 3 was christened on Oct. 17, the anniversary of the 1989 San Francisco earthquake. The quake burst the domestic water lines beneath the city. Should this happen again, the new fireboat will ensure that San Francisco has the water it needs to protect its citizens and property. So what do you think? Would you captain one of these huge suckers if you had the chance?